The expansion of the region’s GastroNorth foodie programme, the Utzon 100 celebration in Aalborg and the chance to find out why the area’s coast is known as Cold Hawaii͛ are just three reasons to explore North Jutland IN 2018. Add in new stylish coastal hotels to an area that’s reputed to have more hours of sunshine than anywhere else in Denmark plus the chance to explore the region on the back of a Harley-Davidson and it’s easy to see why the ‘land of light’ at the top of the Danish peninsula has even more to explore this summer. North Jutland’s gastronomic scene has seen massive growth in recent years and for 2018 GastroNorth, which was founded in 2016 by five of the region’s leading gourmet restaurants has expanded to double its previous size with 10 of the leading restaurants now working together with the aim to attract international gourmet guides to the region and ensure the cuisine of North Jutland is recognised in the same way as that of Copenhagen or Aarhus. 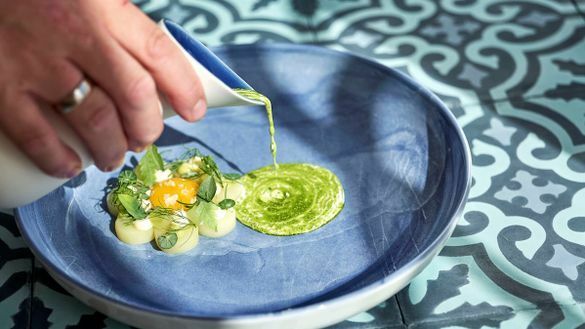 Along with Mortens Kro, which celebrates its 20th birthday as Aalborg’s premier modern gourmet restaurant three further restaurants in Aalborg join the line-up – Applaus, La Locanda and Textur. Of these Textur is the newest, having opened in August 2017 under the direction of Dennis Juhl (who also works closely with ‘Ruths Gourmet’ and ‘Ruths Brasserie’ at Ruths Hotel in Skagen where he previously head chef) with the ambition of limiting food waste by having a menu based on eight different options using locally grown seasonal ingredients. Adding to the group, at the most northerly tip of North Jutland in Skagen, is Brøndums Hotel, serving classic Danish cuisine with a menu that includes dishes based on Madam Brøndum’s original recipes dating back to the 19th century, as well as modern favourites. Whilst on the west coast at Blokhus the new Strandhotellet Blokhus, which opened in June last year, draws on the catch of the day brought in by local fisherman to serve the finest sea food alongside locally reared meats and organic vegetables from local growers for its seasonal menu. Along the coast from Blokhus at Lønstrup, the new Glashuset restaurant (The Glass House) opened in March 2018. With the same owners as the successful restaurants – TABU and CANBlau – in Aalborg, Glashuset serves a classic Danish lunch menu of freshly locally caught fish along with an evening menu of quality local meat fresh from the grill. The three-course menu with wine and coffee costs from approximately £58 pp (DKK 500). As the Utzon Centre in Aalborg celebrates its 10th anniversary this year, it is also marking 100 years since the birth of Jørn Utzon, widely recognised as the most significant Danish architect of the 20th century. Under the name ‘Utzon100’ there’s a year of exhibitions and events in Aalborg and around the world, ranging from Horisont, which is showing in Aalborg before moving to Copenhagen, Sydney and Brussels. Additionally, films, conferences, talks and music will ensure that 2018 is full of experiences all inspired by the work of Utzon. For those visiting the city the Radisson Blu Limfjord, in the heart of Aalborg has completed a grand redesign for 2018. With an emphasis on new Nordic décor and Danish design furniture, the hotel has refurbished all 188 rooms as well as the restaurant, bar and lobby area. Whilst on the beach in the centre of the coastal town Løkken the new Hotel Løkken Strand is the perfect base for a holiday on the West Jutland coast. The hotel is located in one of the oldest buildings in town – the old school building dating from 1926 – and has been redesigned in classic Danish style with the school’s old gym serving as a breakfast room and restaurant offering a fusion of French cuisine with Danish produce. In June last year the Beach Side Hotel Strandhotellet Blokhus opened in the west coast town of Blokhus. The newly built beachside hotel was designed with reference to the old beach style hotels of the 1920s and 30s, with architect-designed panels, handmade doors and retro windows adding to the look and feel of the exterior. Whilst inside a mix of old and new has creating a light and unique atmosphere in the 38 double rooms and an apartment, along with a restaurant that is now part of the GastroNorth network. The north west coast of North Jutland offers some of the best surfing conditions in northern Europe, and thanks to the similarity between its wind conditions and the famous US state has earned the region the nickname ‘Cold Hawaii‘. At Klitmøller, there are, for example 31 different surfing spots, and since 2010, this has been the location for the international surfing competition ‘Cold Hawaii PWA World Cup’. Beginners can also take advantage of the cool north Atlantic rollers with courses offered at the Cold Hawaii Surf Camp, whilst along the coast at Løkken, a new surf school, North Shore Surf, offers newbies the chance to hone their skills alongside SUP tuition, paddle boarding, yoga, spa facilities and a sauna. At Thy National Park, Vilsund, the ‘Book a Biker’ experience offers the opportunity to discover this incredible national park accompanied by the roar of a Harley-Davidson motorbike. Bikers will pick guests up at an arranged place, and drive out to Thy National Park, where they will do their best to deliver one of the coolest experiences on two wheels. From beautiful and rugged Stenbjerg, where fishing boats dot the beach, tours continue to the coast at Klitmøller and Hanstholm lighthouse, from which there is a magnificent view of Thy and the National Park. Helmets, gloves and jackets are all provided. It costs from £70 for an hour with additional hours at £58 pp. Getting there… Norwegian offers direct flights from Gatwick to Aalborg with return flights starting from £60. RyanAir also flies direct from Stansted to Aalborg from £26 return per person.